Seafood Specials for Lent at Posa’s Zafarano! Are you ready for a sea of deliciousness at Posa’s on Zafarano? We are excited to announce our amazing specials starting February 17th through March 17th of 2016. In celebration of the season we are honoring lent with some amazing seafood dishes that will delight your taste buds and keep your wallet full. Our first menu item is a trio of fish tacos and the second is a nice serving of tasty shrimp tacos. 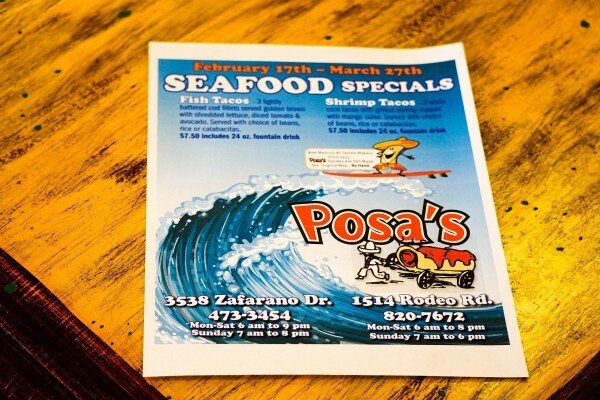 Some come to the Southside of town and try our amazing seafood specials this month at Posa’s on Zafarano. Our fish tacos are absolutely divine. They are lightly battered cod fillets fried until golden brown perfection. The deep fried cod fillets are nice and crispy on the outside and perfectly cooked on the inside to creating the perfect balance of slight crunch. The amply sized fillets are served on our famous soft tortillas. To finish it all off the tacos are topped with crunchy lettuce, and fresh tomatoes, and delicious avocado. As always you also get to choose two of your favorite sides served in our amazing fried tortilla bowls; the selection includes our perfectly cooked pinto beans, the tasty Spanish rice, or our flavorful calabacitas. You will also get a 24 ounce fountain drink, and all of that is only $7.50, yes please! Our shrimp tacos at Posa’s Zafarano are simply heavenly. They are made from a generous serving delicious shrimp, and are freshly grilled to order. The smoky flavor shines through as the shrimp are set on a bed of homemade soft golden corn tortillas. To top off the flavors of this amazing taco they are decorated with our fresh homemade mango salsa. These flavors marry to create a bold, zesty, and smoky flavor combination that is pure bliss. They are served with your choice of two of our famous sides including our fresh veggie calabacitas, tangy Spanish rice, and of course our home cooked locally grown pintos; all sides are served in our delicious and edible tortilla bowls. After a tasty meal like this you are bound to be thirsty, and you will be able to quench that thirst with one of our 24 ounce fountain drinks that accompanies this awesome special, all that for only $7.50. So there it is, come to Posa’s on Zafarano and try this awesome special today! 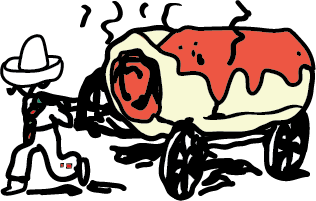 We are open for lunch, dinner, and breakfast!